THE BEADY EYE ASKS: WHAT SHOULD THE EU SEEK IN THE BREXIT NEGOTIATIONS. Posted by bobdillon33@gmail.com in Brexit., England., European Commission., European Union., Modern Day Democracy., Our Common Values., The Obvious., Unanswered Questions., What needs to change in European Union. Philip Hammond urged EU countries to “think very carefully about what they want” before hanging Britain out to dry in any post-Brexit settlement. 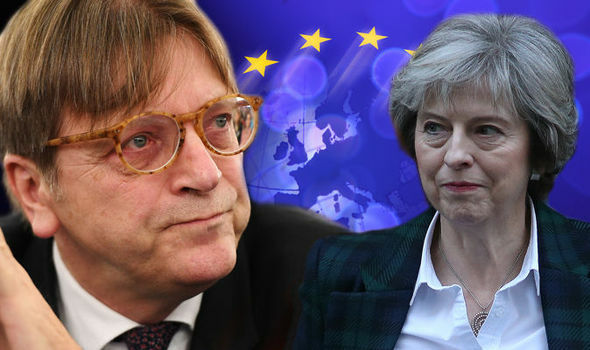 The fact that even the process for conducting these negotiations is not fully covered by European law his advice although cloaked in threatening rhetoric should be heeded by the EU. Article 50 of the Treaty on European Union (TEU) is the only formal structure for the negotiations but offers no more than a broad framework for the negotiations. More detailed guidance will largely depend on legal interpretation and political bargaining, and will only be issued after the UK activates article 50 and begins exit proceedings. To date I have only heard in vague terms what the UK wants. It seems to me at the moment that there is no consensus on how the UK should approach negotiations on its relationship with the EU. In particular which parts of its current relationship with the EU the UK seeks to preserve and which it has to either renegotiate or walk away from. This post asks what from an EU perspective what will the negotiations mean. The European Council’s main role is to define the general political direction and the priorities of the EU. Although it has no formal legislative power, it has an influential strategic role and provides a final escalation level for discord among member states at the ministerial level. For the negotiations on the exit conditions, the formal role of the European Council is limited to the beginning of the negotiation process. It will then set out the guidelines for the withdrawal agreement, without the UK’s participation, through unanimous agreement. These guidelines will provide general directions and key conditions for the Union negotiator, the European Commission. They will also define the role of the other institutions, the time path and sequence of the negotiation process. The European Commission is ultimately responsible for negotiations related to the common foreign and security policy (CFSP). In addition to this, the European Parliament has voted in favour of having the Commission led the negotiations. Out of all the EU institutions, the role of the Parliament is, in legal terms, the least clearly pronounced. Although it has to sign off, by simple majority, on both the exit proceedings and the any future trade deal, its involvement throughout the negotiations will remain uncertain until the European Council issues its guidelines. Nonetheless, the possibility that the Parliament can block the deal(s) gives it significant power over the negotiation process and the content of the agreement. The European institutions that are involved in the negotiations each cater to different interests. The Council represents the Member States, the Parliament the European citizens, and the Commission stands for the EU as a whole. For that reason it is crucial that the European Parliament gets a strong role in the negotiation process. It would be difficult to think of a better way to show the benefits of European citizenship, for the British and for Europeans alike. That the European Council issues negotiation guidelines that serve the interests of European citizens and Europe as a whole, and not just those of the Member States. That the Parliament’s role is defined by the recognition of its political input and the citizens that it represents, rather than by its mere power to block an agreement. That the European Parliament, as the highest democratic body of the European Union, be involved in all steps of the negotiation process. This is to be achieved by: setting up a special committee to formalise interinstitutional contacts between the Brexit negotiators from the Council Task Force, the Commission and the Parliament; and by making the European Parliament’s lead negotiator part of the Union’s negotiating team. It is quite obvious that there is going to be not just one deal, but probably two or more. A pretty core question is whether the UK is prepared to concede even the principle that it has liability for any EU expenditure, beyond the pensions of UK citizen employees of the EU. My guess is that will not be conceded per se, but that one could imagine some notional payment being made, for purely political presentational reasons, to secure a trade deal. I’m thinking of something like £7bn under some pretext-or-other, plus an annual agreement to participate in this or that research funding programme and some pan-European anti-crime-and-terrorism fund. It also seems to me that the EU is going to have to re-negotiate some of its own terms of international trade due to a downsizing of its market. Will the UK be paying the cost of these negotiations. Unfortunately the English don’t seem to understand that the decision to join the EU was irrevocable. The people of England listened to a bunch of charlatans promising a “Global Britain”, rubbish; Britain has nothing to sell. Yes, the City of London , due to its peculiar legal status will remain the world center for money laundering and financial manipulation, aside from that what have you got? You just had to hire the Chinese to build a power station! The apparent prosperity of the last 25 years has been built on a mountain of debt, which means that if BofE is forced to defend the pound by raising interest rates the whole economy will come crashing down. Expect the GB pound to hit 50cents US within months. And don’t think you have any credit left with the old empire, after the stab in the back of Australia and particularly New Zealand nobody is interested in your BS. If you had any sense at all you would all ask May to admit that voting to leave was a big mistake and please take us back. The EU is perfectly within its rights to take into account any repercussions to their union’s stability in the way they approach Brexit. Britain can leave anytime they want – they just can’t expect to receive all the privileges that came with membership. Britain will find out soon enough that leaving the EU is like the spoiled teenager who runs away from home because their parental units won’t buy them the latest iphone. All of a sudden they are cold, dirty, wet and hungry. Theresa May has said she intends to trigger this process on 29 March, meaning the UK will be expected to have left by the summer of 2019, depending on the precise timetable agreed during the negotiations. She wants with a “comprehensive free trade deal” giving the UK “the greatest possible access” to the single market to reach a new customs union deal with the EU without the free movement of people. No matter what, on both sides there are now massive vested interests under threat and hence they will stop at nothing to protect the machine. Nothing. In the end it is the people on both sides that count. In or Out.